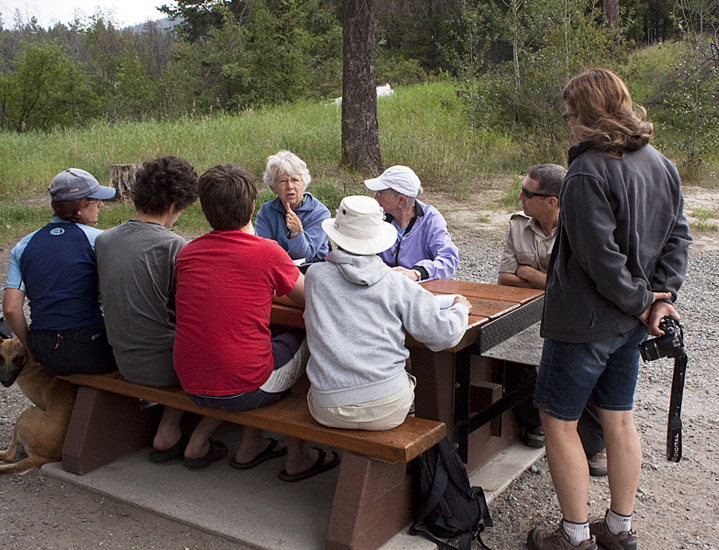 The Nicola Naturalist Society had a busy spring and summer, especially on the amphibian monitoring front. 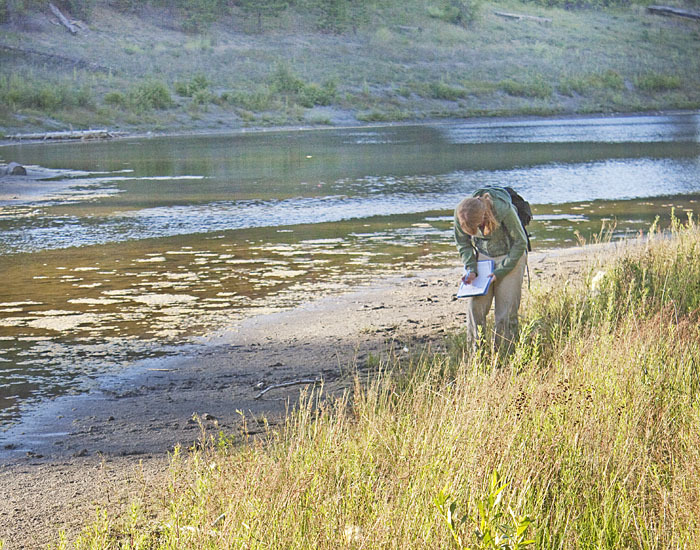 With a second year of funding from the Public Conservation Assistance Fund (PCAF) and in collaboration with professional herpetologists from Biolinx Environmental Research of Victoria, we continued our mapping and monitoring of amphibian breeding sites in the Merritt/Coldwater/Nicola Valley area. 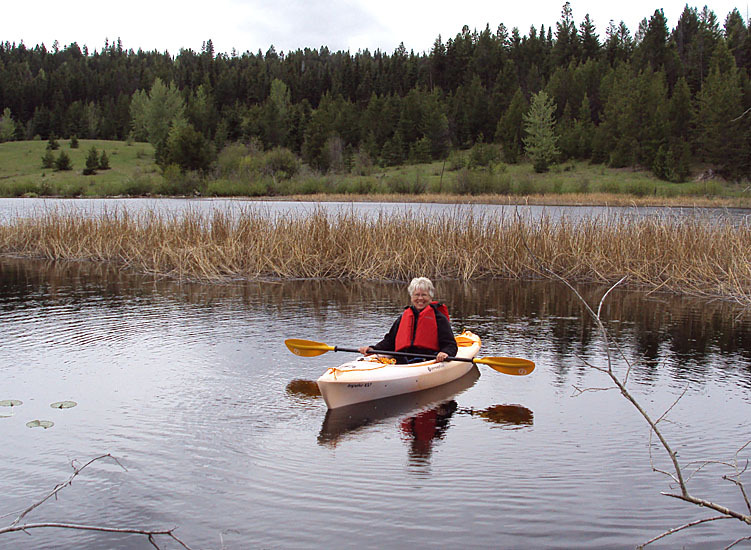 Our PCAF grant allowed us to purchase two spiffy plastic kayaks and with these tough and maneuverable craft we could more easily check for frogs, tadpoles and egg masses in the shallows of larger ponds and small lakes. NNS members contributed over 300 hours of volunteer time for this project in 2012 and we discovered several new breeding sites this year, while monitoring amphibian numbers at sites we discovered in 2011. We also undertook a new project to study the migration of newly-metamorphosed Western Toads at Kentucky-Alleyne Provincial Park with funding from BC Parks (Parks Enhancement Fund). Thousands of tiny toadlets move from a breeding pond into the forest at the park, but unfortunately their route takes them across a busy road in the campground and many are killed by traffic. 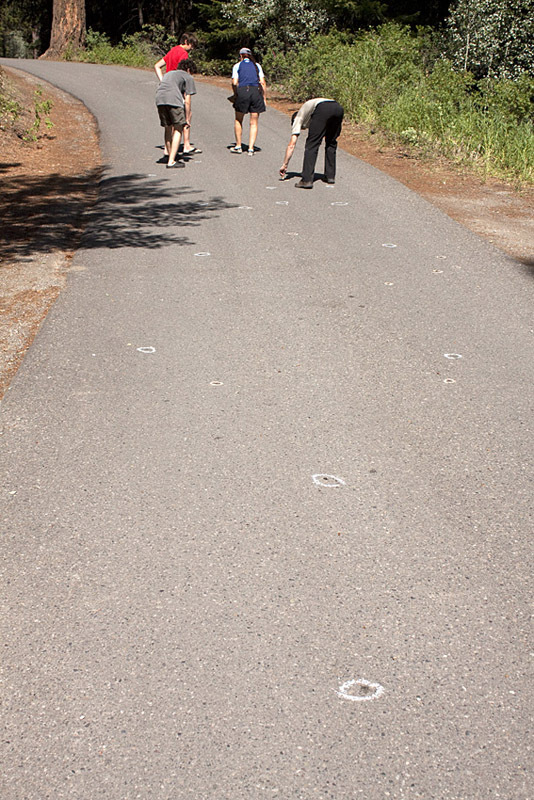 NNS volunteers made numerous visits to the park during the toadlet migration to map out the areas where most of the toadlets cross the road and to mark out the areas where toadlets are being killed. Thompson Rivers University student Chantelle Forseille undertook part of this work as an undergraduate project. She focused on monitoring the movement of the toadlets out of the breeding pond. 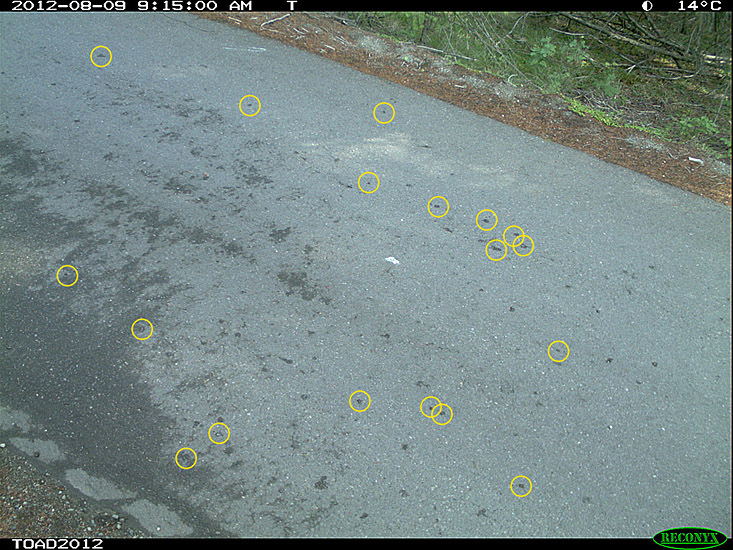 We also set up two automated time-lapse cameras, kindly loaned to us by the BC Ministry of Transportation and Infrastructure, to monitor road sites where there was a lot of toadlet activity. 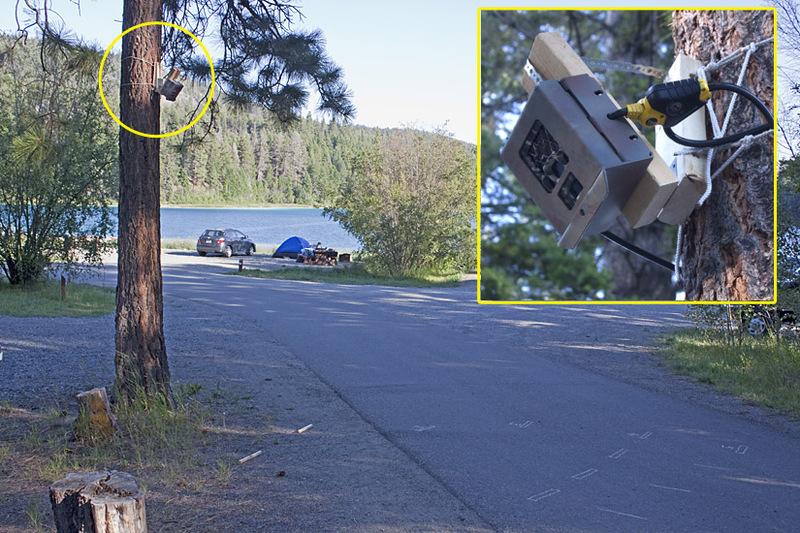 The cameras were mounted on trees (and secured with locks!) and took a photo every 15 minutes round the clock. An automated time-lapse camera mounted on a tree (circled) in Kentucky-Alleyne Provincial Park to monitor movements of Western Toads across the campsite road. The inset gives a close-up view of the camera. Here is a photo taken by the time-lapse camera at the peak of toadlet migration – the individual toadlets are very hard to spot but by reviewing a series of sequential photos researchers could see them appear on the scene. 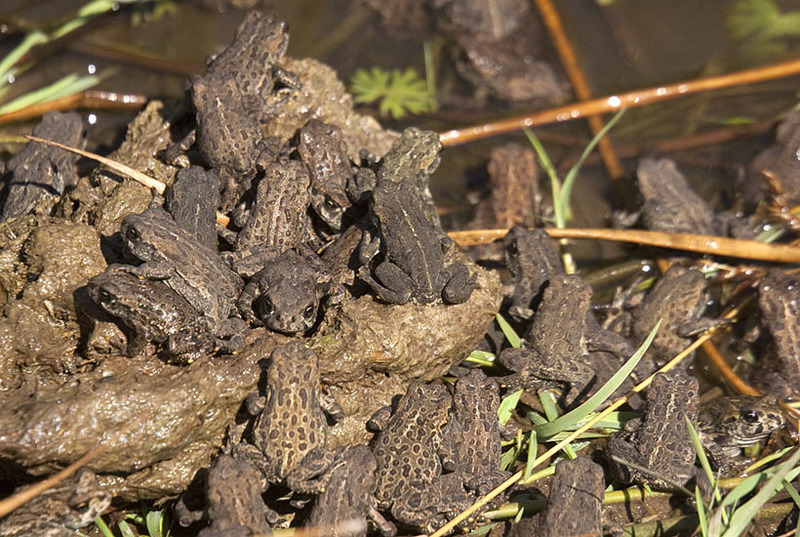 Photo from one of the time-lapse cameras showing toadlets identified in the higher resolution version of the this photo (circled). At night the cameras use an infra-red flash (invisible to human eyes) to illuminate the scene for each photo. The toadlets are very hard to see at night but with some training we could pick out the moving toadlets to show that they were active at night too. 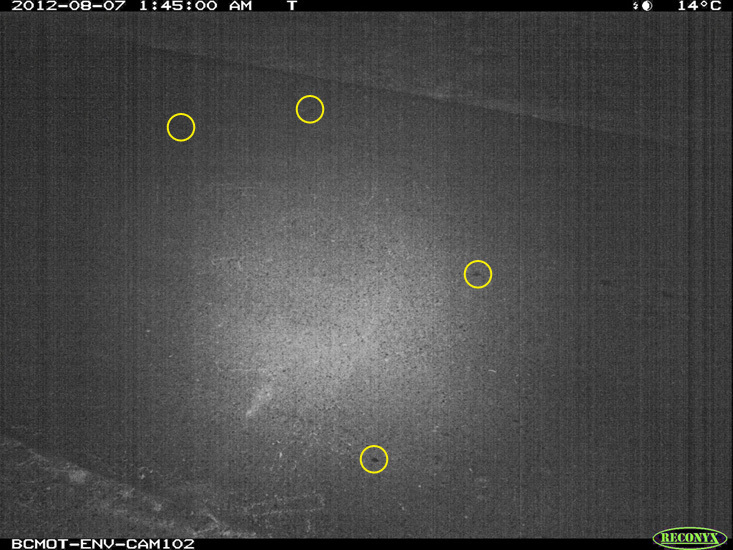 A night image from one of the time-lapse cameras. Western toadlets seen appeearing in the image are circled. With the combined efforts of NNS volunteers, Biolinx biologists, and BC Parks staff we will have good information on where and when the bulk of the toadlets cross the road. 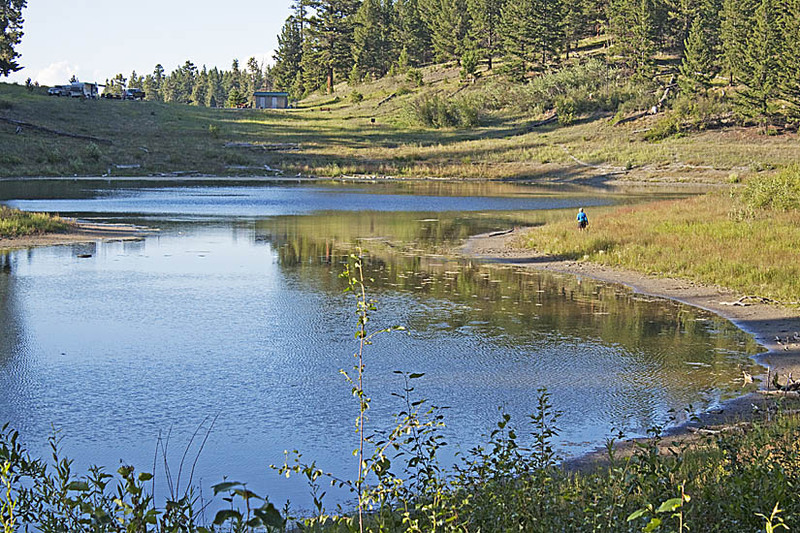 BC Parks can use this information to consider mitigation measures. The response from members of the public camping at Kentucky-Alleyne was overwhelmingly supportive – park visitors were very interested in our project and in helping to save toadlets. This entry was posted in Features, Projects, Uncategorized. Bookmark the permalink.